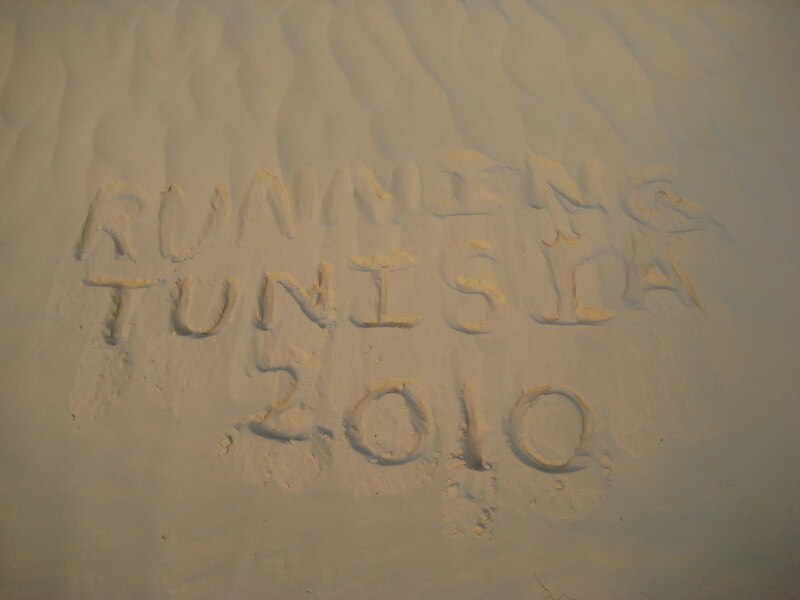 "Today is the last day of running for our Youth Ambassadors, they will finish their epic run in the Tunisian Sahara with a 12 km ceremonial finish run near the city Matmata. I will be waiting for them at the city limits with the i2P banner- totally pumped to see them complete their journey. Fundraising continues for the water projects, and we will announce the results in the coming weeks. I am not saying goodbye just yet- we still have several blogs to come from Tunisia as the Youth Ambassadors visit Tunis and Matmata. Keep reading, and thank you for participating !" 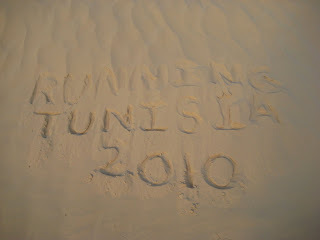 Running Tunisia Day 3: Today We Ran a Marathon! Although we all woke up feeling exhausted, stiff, sore and needing an ice bath this morning, we left camp around 7:30 am and made our way towards the town of Douz. 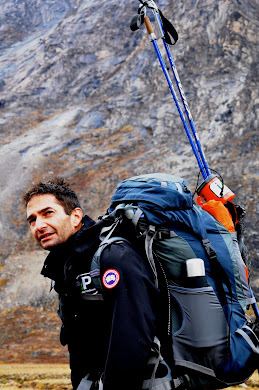 As we continued forward, our legs began to loosen up and our pace increased. Everyone was starting to feel a little bit better and we were all very excited to reach our goal of completing a full marathon! Today we made it into the dunes, which were incredible! The sand was lose and textured like flour, but absolutely beautiful! It felt like we stopped for photos every few steps. Our guide, Arida, decided to come with us on our run, in hjs long pants, sweater and cheche (pronounced sheesh). While running, he taught us traditional Arabic songs and games, and showed us a variety of different animal tracks including scorpion, scarab, camel and warthog. 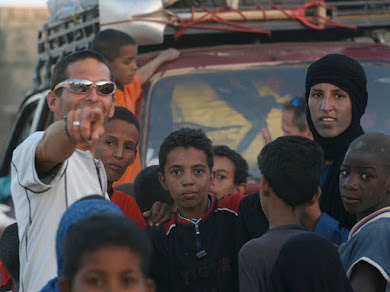 It was amazing to hear all his stories and learn more about the nomads of the Sahara! We had another incredible lunch and after a brief nap, after a recommendation from Mohammed Ixa, who told us it was going to be too hot to run in for the next hour, we continued forward. And sure enough, the next hour was extremely warm and when we woke up, and began running, the temperature had cooled down dramatically and the heat was manageable. Over the next 17km, we came across two beautiful oasis’ filled with palm trees, lush green shrubs and even a well! The scenery here is absolutely incredible! As we got closer and closer to the 42.2km mark, we began feeling better and better. 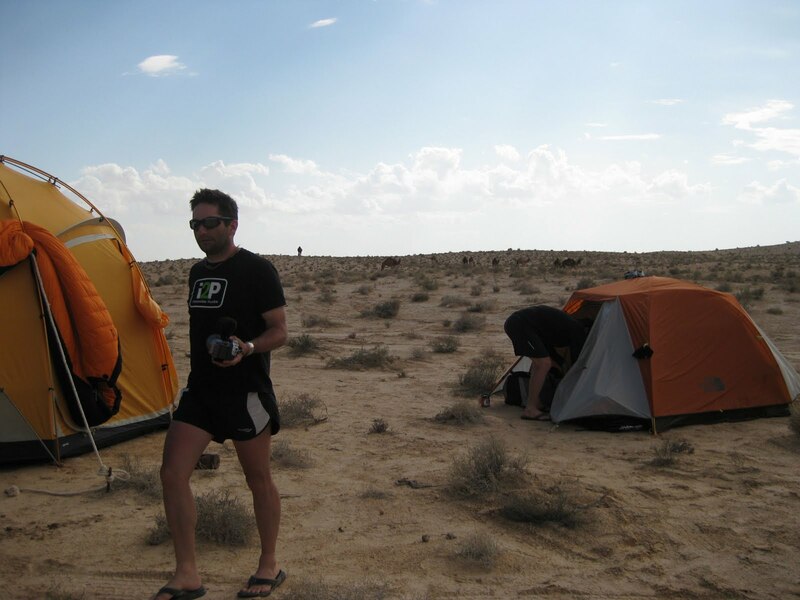 We pushed for the finish and successfully completed a marathon in the desert! We were all very happy and even happier when our support team had oranges waiting for us – Tunisian oranges are by far the best oranges in the world!! 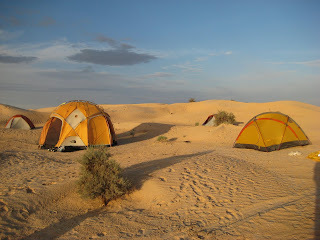 We just finished setting up camp in the sand dunes and will likely sleep very well tonight. Talk around camp is that we might be getting an Arabic flute show later on! Another amazing day in the Sahara Desert!! 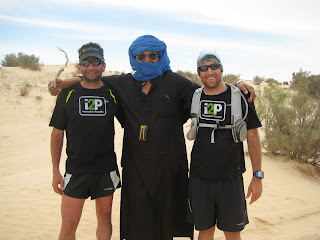 Today was our first full day running in the Sahara. After a long drive of about 2.5 hours, we began running in the hopes of reaching our goal of 42.2 km by the end of the day – a distance that neither Jill, Kajsa, nor Connor had ever ran in a single day before. The first 20 km was… muddy. The unbelievable lightning/rain storm the previous night had altered the land to such a degree that Jill was skating across the desert. We continued to move forward in the search of lunch – something that the youth ambassadors had been fixated on from km 15 – 20. When we finally crested the hill, we looked down upon the land cruisers and an outstretched blanket covered with sandwiches, oranges, dates, tea… and Mohammed. After our lunch break, we began on the second part of our day; however, during the hottest, most uncomfortable part of the day, we almost immediately experienced problems. Jill was experiencing dehydration as well as nutrition issues. She created a masterpiece on the side of the trail consisting of everything consumed in the past 12 hours as well as sound effects we had never heard before. 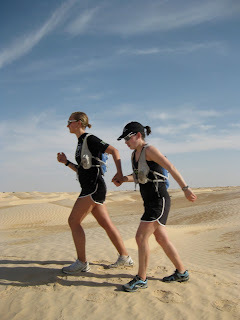 We made a collective decision to take an easier pace, as it was stiflingly hot at about 33 degrees Celsius. Things were looking up, but at about 33 km, Jill decided to not only hit the wall, but take it out and allow it to fall on top of her. The day finished with a positive attitude, as we were treated to authentic Arabic music complete with sing-a-long in the land cruiser as we jostled down the road back to camp. Jill’s experience today with dehydration really helped us to appreciate the importance of drinking enough water, which has implications not only for completing the trek but makes us realize that people who do not have access to clean drinking water are at a severe disadvantage. The day started out with a 1.5 hour drive with rockin’ Arabic/French music in Nardeen’s car to start where we finished yesterday. After a tough day yesterday, we made a collective decision to run 20 minutes, then do a fast walk for 2 minutes. 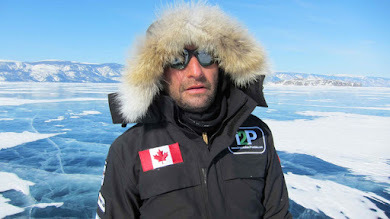 Our goal was to make it back to camp, about 36 km, and everyone was feeling pretty good around lunch time, however, the heat of the day was beginning and we still had about 16 km to go. After lunch, we came across a herd of dromedaries (one-humped camels) and watched as Andy chased them around the desert in his attempt to ride one! As the heat pressed down on us, we tried to focus on hydrating properly and keeping a consistent pace while out on our own. Throughout the first two days, Kathy (Ray’s wife) had been running alongside with us and helping with pacing, but today, she deemed us ready to go out on our own and make our own decisions on proper speed for running a multi-day expedition. The heat was very hard to take the last 10 km, but we worked together to keep everyone motivated and could not have been happier when we crested the hill to overlook the camp in front of us. Back at camp, we had an interesting educational discussion with Doc Affleck about a variety of water issues as well as facts and interesting history about the theories of the origins of water. Ray had us do an experiment where we carried 12 litres of water around camp to get a feel for what it is like for children to carry water for miles on end that is necessary for their everyday life. Hi Everyone! My name is Kat and I'm one of i2P's advisors. 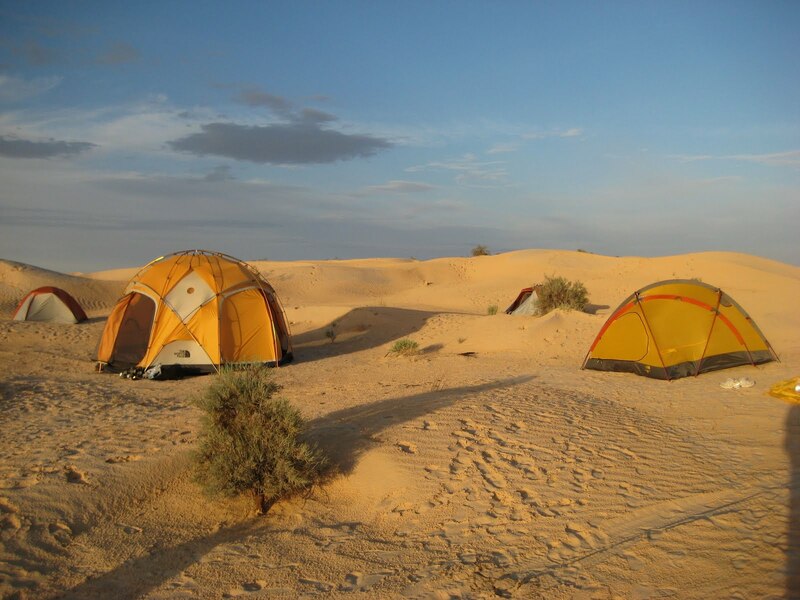 While Ray and the i2P team are in Tunisia, I'm going to guest blog to keep you updated on all of their incredible adventures- before they left they had to navigate being challenged by a volcano! 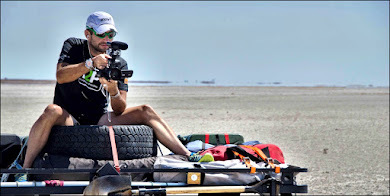 "As it goes with any expedition you need to have proper planning, a good logistics team behind you, and of course a lot of luck! Today's Volcano in Iceland has put us into an early adaptation mode since the last update we received was that our flights from Montreal to Paris had been canceled! Fortunately the impossible2Possible team has McCord Travel, an amazing travel agency supporting us and first thing this morning they were hard at work trying to reserve us a flight into Tunisia through an alternative route. At this point we have flights reserved and as I write this they are trying to transfer the new tickets. Our new route has us heading through Morocco and only landing 2 hours behind our original travel itinerary! The team has spent the morning in orientation and we are all getting to know each other! It was great to finally meet the youth ambassadors in person! We couldn't have selected a better group of four for this journey! We will keep you posted of any other travel changes!" 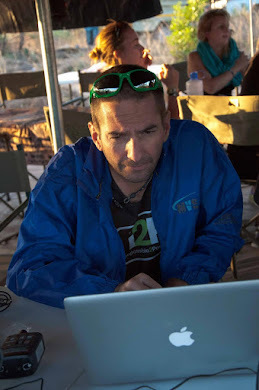 Youth Ambassador Intros from GOi2P on Vimeo.